A mouth-watering contest is just one of the reasons to be there at Marvel Stadium on Sunday afternoon. The Saints and Hawks sit level on points with two wins apiece from the opening three games. A win on Sunday afternoon would lock in a bright start by Alan Richardson’s men and provide the perfect platform to attack the likes of Melbourne, Adelaide and the Giants in the following three weeks. Everyone’s favourite activity is back on Sunday, with patrons allowed on the ground after the final siren. 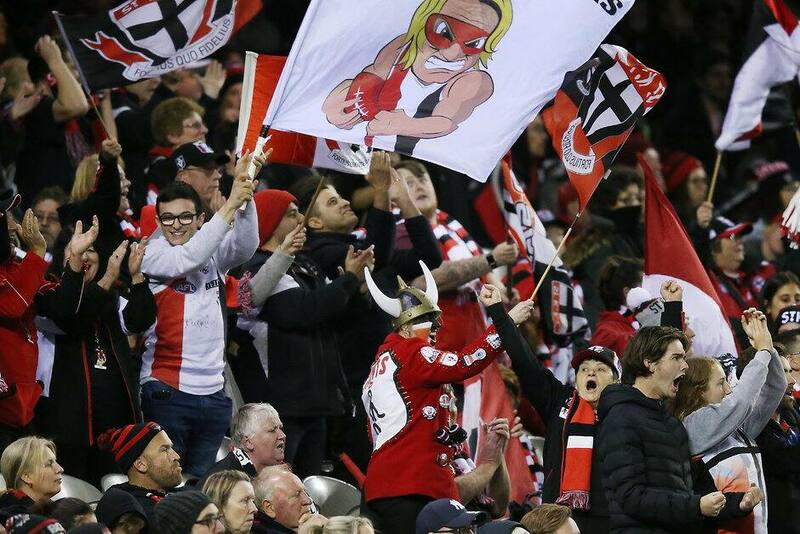 Bring your footy to the footy and snag a goal after hopefully belting out ‘When the Saints come marching in’. Jade Gresham, Jack Billings and Jack Steele have all started the season in fine form and will be crucial to overcoming the Hawks. Gresham and Billings have added a different element to the Saints' midfield, while Steele continues to emerge as one of the game’s great two-way runners. Gates will be open from 11.30am, with the Saints-listed youngsters hitting the field with Sandringham in an old-fashioned curtain-raiser. The first bounce in the VFL match with Box Hill Hawks is at 11.50am, with approx. one hour between the final siren and the start of the AFL clash. Some players just make you smile, and Parker’s forward line pressure is something that needs to be seen in person. Saints ambassador Jane Bunn is forecasting a sunny 22 degrees on Sunday, making your trip to Marvel just that little bit more enjoyable. Level 1 tickets might be just $35, but you can’t go past free admission for kids as another reason to bring the family down for the traditional afternoon clash. Buses will run express from Moorabbin Station for those who usually take the Frankston Line. The Saints were written off in the off-season, and that was BEFORE injuries to several key players. The response to date has been clear; and a resilient Saints outfit will be looking to take another giant step against the Hawks in the Round 4 bout. The Saints are making the football more accessible for all fans, especially those with autism or sensory process disorders. The Sensory room is located in the Victory Room and provides a chill-out zone that is an escape from the colour and noise of the grandstands. Alan Richardson spoke about it on Friday, the impact of the Saints faithful on the players. A big crowd in full voice is exactly what we need to dismantle the Hawks.